Almacigo Systems, Inc. is supporting the U.S. Navy's Naval Sea Systems Command Weapons Simulations Department at the Indian Head Base in Maryland. Our primary responsibility is the management of the IH server farm and all the services running on those servers. The server farm is composed of multiple high density Compaq ProLiant servers, some only accessible to the local Intranet users, others are running services that are available to the Internet. We are responsible for the security of the servers, which we implement at various levels to make sure that all risks, either internal or external, are mitigated. We also manage the configuration of all the services running on the servers, which include: an Oracle Application Server with the Oracle database, multiple SQL Server 2000 instances, the Internet Information Services Web server, the Apache Web server, the Cold Fusion application server, ASP.Net services, and FTP servers. And finally, Almacigo Systems, Inc. also provides the U.S. Navy with software development services consisting of Web application development using ASP.Net, Cold Fusion, SQL Server 2000, and Oracle. The Marine World Surf Shop is a multi-store business located in Puerto Rico. We provide them with network infrastructure design, installation, and support services for the networks that run business critical applications, including their Point of Sale software and cash registers as well as other office automation tools. We have been there from the beginning and were responsible for the design and installation of a high availability Compaq ProLiant server to run the business applications. When DSL lines became available at the store locations, we assisted Marine World with the connectivity to the Internet and assisted them in leveraging the Internet connectivity to enhance the functionality of their systems in ways that were not possible before. One area where we have provided significant assistance to Marine World is in systems security. We helped them implement various policies, procedures, and hardware devices that together provide a secure and high performance platform for their business applications. We also assisted Marine World with the installation, configuration, and integration of a PC based video surveillance and digital video recorder system that allows the owners to monitor and record digital video from multiple cameras remotely. College Park Judo Club, Inc.
We developed, and are currently hosting the Web site for the College Park Judo Club, Inc. located in College Park, Maryland. As a Not for Profit organization with a very active schedule and membership, the CPJC needed a way to better communicate with its members and the public in general. The CPJC also needed a site that can be kept up to date with minimum effort in order to better disseminate information to its members and that helps the recruitment efforts for the club. We believe that we exceeded those expectations. We developed the site for the Judo Club Pro-Bono and utilizing the DotNetNuke Content Management System we were able to do it with no additional costs and providing a very complete set of features for a Non-Profit organization site. The site is now a great marketing tool for the club and it is frequently used to provide tournament information, dates, registration forms, and pictures of the club members in action. DotNetNuke is an open source Content Management System that was developed using Visual Basic.Net and utilizes a SQL Server database as the data repository for all the content of the site. The Hunters Creek community is located in Howard County, Maryland. Its Home Owners Association needed an effective and secure way to communicate with the residents of the community in order to better serve their needs. They needed a low cost solution but at the same time a very flexible one that could accommodate the requirements of the various clubs and committees that are part of the HOA and the community in general. They also needed a solution that is easy to manage. For all these reasons, Almacigo Systems, Inc. proposed and implemented a Web portal solution based on the DotNetNuke portal software. 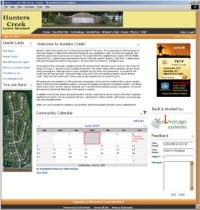 Utilizing VB.Net, ASP.Net, and SQL Server 2000 in its core, the Web portal provides a flexible and high performance solution to the Hunters Creek Home Owners Association. In addition, because of the architecture of the DNN portal software and its built-in features, it is possible to delegate the management of different areas of the site to different people based on predefined security roles. The training for these individuals is minimum as the management of the site does not require knowledge of HTML page composition, the site is managed with a browser based tool that can control all the modules in the portal. In addition, Almacigo Systems, Inc. is in the process of developing some custom modules for the portal to satisfy very specific requirements that cannot be satisfied by the standard portal modules. Almacigo Systems, Inc. also provides the hosting of the site.